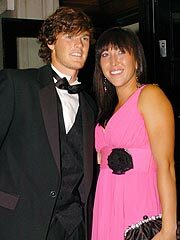 Their extraordinary on-court chemistry set tongues wagging and despite Jamie Murray and Jelena Jankovic’s insistence that their relationship is purely professional, the Wimbledon mixed doubles winners looked the perfect couple as they celebrated at the annual Champions dinner. All eyes were on the duo as they arrived at London’s Savoy hotel, happily posing for photos together, with their fellow tennis pros. After their victory, Jamie – Britain’s first Wimbledon title winner for 20 years – apparently took a great deal of interest in what his partner was going to wear to the ball. “He kept asking me what kind of dress… long or short… and I had to disappoint him by telling him it is very long!” joked Jelena. They weren’t the only ones putting a romantic top-spin on the evening. It was also love all for women’s champion Venus Williams and her golfer beau of six months Hank Kueline. Meanwhile Swiss ace Roger Federer, who won the men’s title for a fifth successive time, was joined by his long-term Slovakian-born girlfriend Miroslava ‘Mirka’ Vavrinec. The duo met at the 2000 Sydney Olympics when both were representing Switzerland.